Looking for the best Sunday Markets in London? Luckily, the city is packed with them. From gastronomic food markets to vintage treasure troves, don’t miss these cool little spots to spend your Sunday. It’s no secret that I’m always up to big up my hometown, but I really do think that when it comes to Sunday markets, London is pretty much unbeatable. 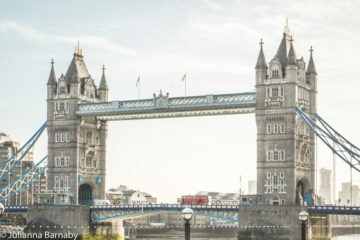 Where other cities fall into a comatose slumber on the Sabbath day, London bursts into life – from food traders touting scrumptious meals to indie makers selling cool trinkets – you name it, you’re pretty much guaranteed to find a stall for it at one of the many markets that pop up around the city. There’s nothing I love more than rummaging around a Sunday market in London – but some of them just aren’t worth the effort it takes to drag your carcass out of bed on the day of rest (I know, the struggle is real right). Here are 20 markets that are very much worth your time. Everyone loves feeling like they’ve discovered a real local gem and that’s what’s on offer at the Maltby Street Market (at least for now). Although it is one of the smaller Sunday markets in London, it is one of my favourites. 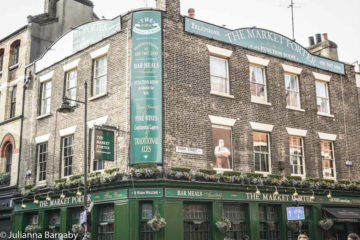 It has been described as the pint-sized version of the Borough Market, thanks to its great foodie stalls. 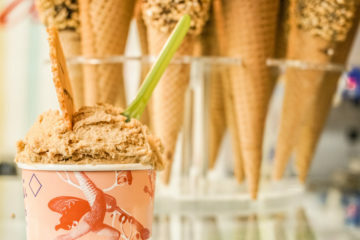 Some particular highlights include Little Bird gin, who have a cocktail bar on the weekends, and Fattie’s Bakery, offering terribly indulgent hot chocolates. 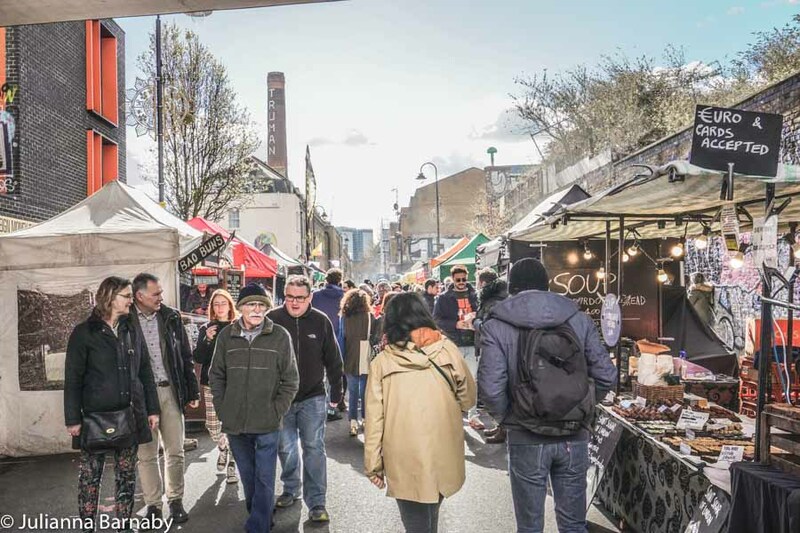 Although it’s bustling, Maltby Street Market isn’t quite as frenetic as some other weekend markets in London – so be sure to check it out while it’s at its best. Who doesn’t love the sight of colourful blooms, as far as the eye can see? Start your day with a smile by visiting Columbia Road, the famous flower market in London on Sunday. 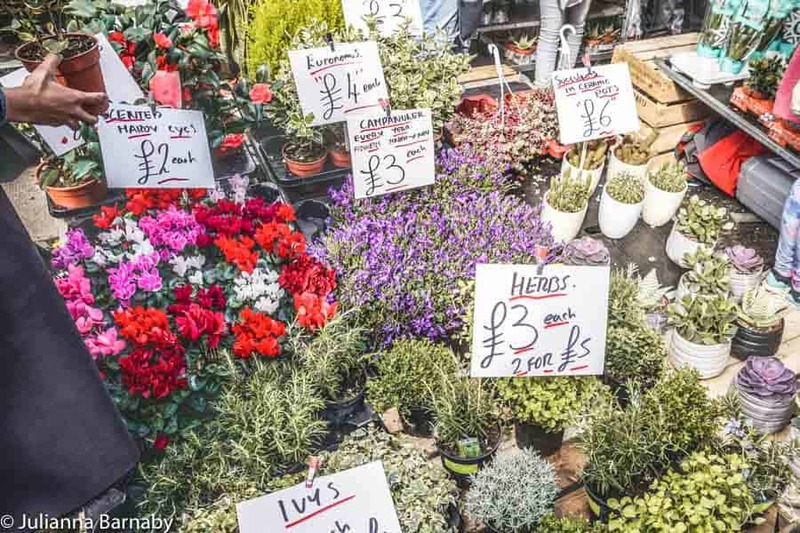 The dramatic colours and beautiful fragrance of the spectacular variety of flowers are sure to impress, and it has a well-deserved reputation as one of London’s most beautiful markets. Nearly all of the sellers here are independent, so why not grab a bouquet to beautify your home and give some pounds to local small businesses? Famous the world over, Camden Market is more pop culture icon than a simple market, and totally unmissable. 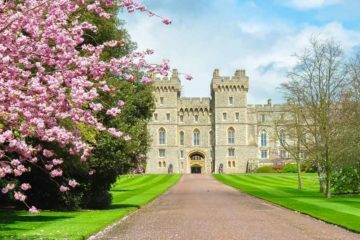 Despite its mega-famous reputation and the fact that you’ll be dodging the crowds, it’s still got an authenticity about it. There are plenty of quirky shops and stalls like the 5 pound clothing stall, creatively named, Everything 5 Pounds. In addition, there’s the brilliant entertainment complex that is FEST in the Stables (so named after the former horse hospital). 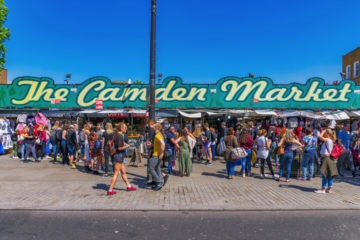 With a nightclub, cabaret hall and laidback diner for brunch, Camden Market is a must visit spot in Camden. 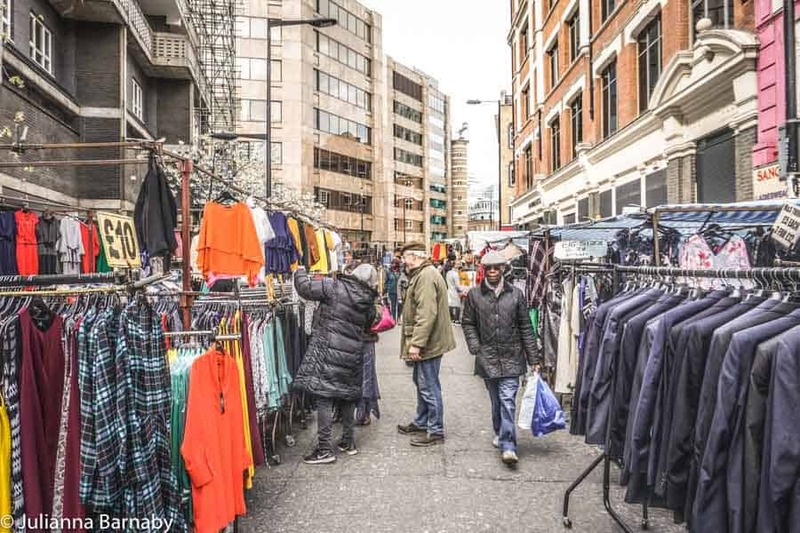 Visiting a flea market in London on a Sunday is a rite of passage for any visitor or resident of the capital, and Flea at Flat Iron Square is one of the best. There are about 30 stalls that regularly attend Flea at Flat Iron Square, meaning there’s enough variety without being totally overwhelming. The stalls heavily focus on retro and vintage items – mostly clothing, jewellery and records, with a few extras (like cameras and home decor) thrown in for good measure. Live music adds to the festive and friendly atmosphere. There are a number of great Sunday markets in East London, but Spitalfields is arguably the best. It boasts a great variety of mainly independent stallholders, selling all kinds of quirky and handmade items including jewellery and art. It’s also a great place to go to find retro items such as clothing, records and cameras. While the market is open 7 days, there are a number of sellers who only attend on the weekend, such as the incredible UK designer Kiwisumo. 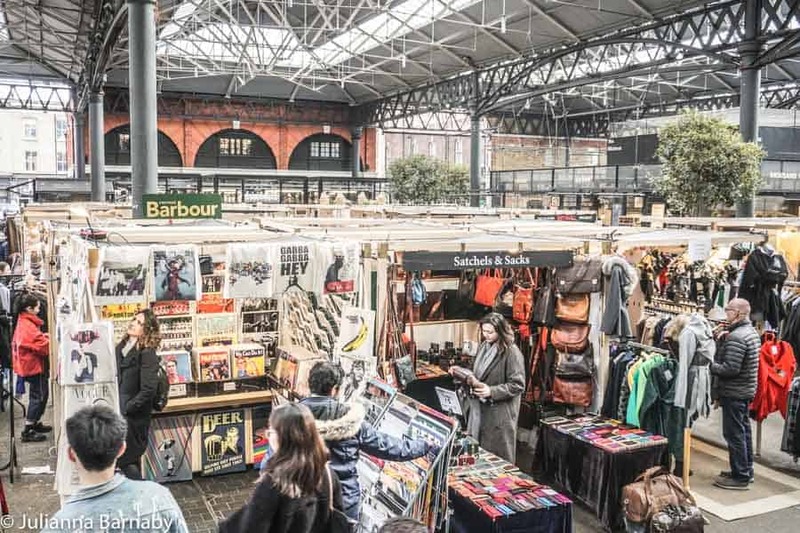 So it is the perfect London market to visit on Sunday and find some unique pieces. 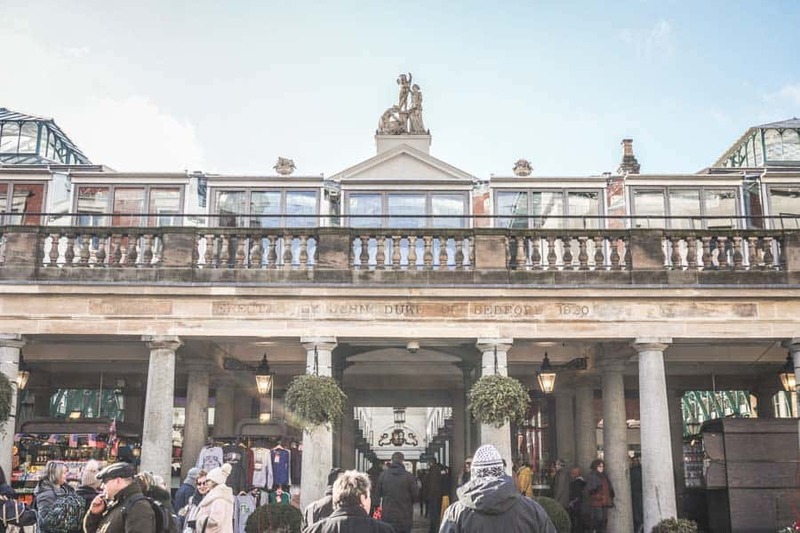 If you’re looking for a London market with a charming historic atmosphere, then you’ll love Greenwich Market nestled amongst a World Heritage Site. This charming market in south-east London is historic, yet it’s far from stuffy – instead, it’s full of quirky stalls and bright colours. I especially love the independent jewellery stores, such as Laura Lees Morgan Jeweller. Every good London street market on a Sunday needs some great food, and Greenwich Market doesn’t disappoint. There’s a good selection, including Munchies, who do awesome Cuban sandwiches. If you’re looking for a fabulous market in London on Sunday, then look no further than Tooting Market. 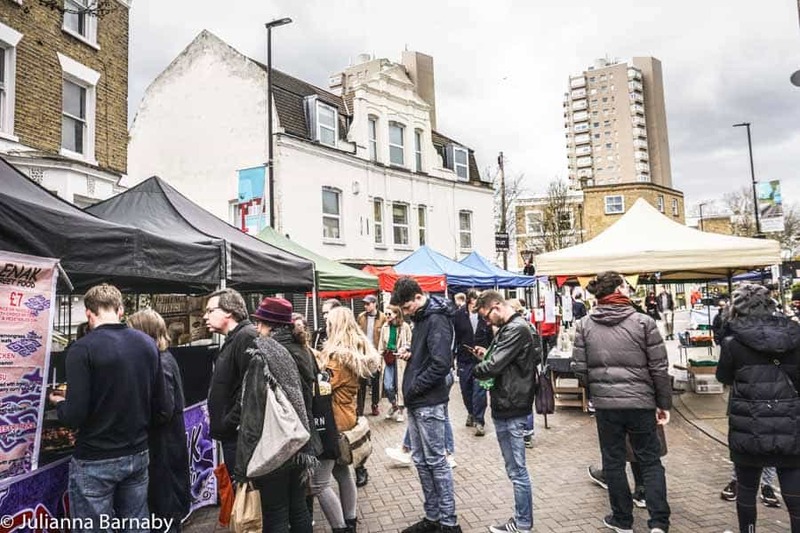 It’s one of the best markets in south London, offering up an eclectic selection of goods including antique furniture, clothing,books and more. There are also more general items like haberdashery and artworks. 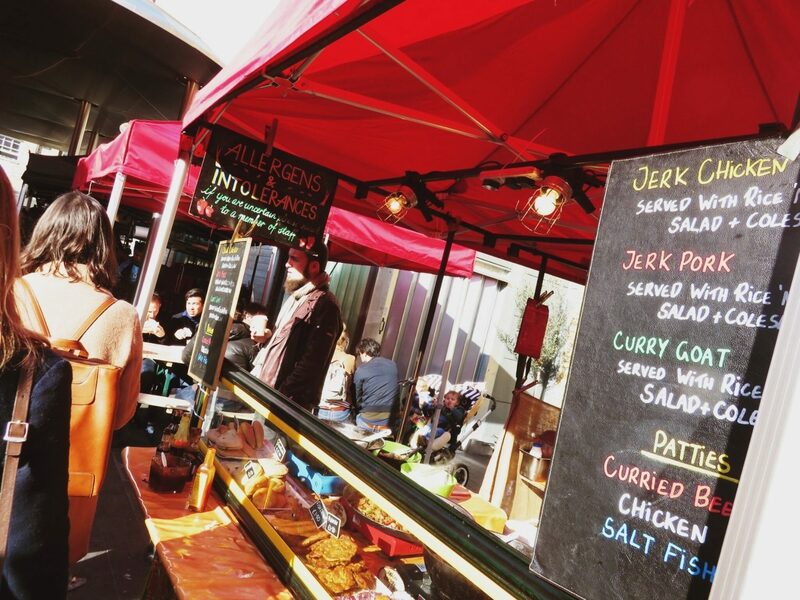 As the market is indoors, it’s a perfect option if the weather is grey – the delicious food options, from Guyanese to Mauritian and everything in between, are sure to warm you up as well! Why settle for one market when you can enjoy three in one? That’s what you’ll find at Covent Garden. First up, there’s the Apple Market which, despite its name, sells mainly jewellery and artworks, while the East Colonnade Market sells everything from magician’s accessories to children’s clothing, and everything in between. Finally, there’s the Jubilee Market, focussing on arts and crafts. As you can see, there’s plenty to see at the Covent Garden market. If you enjoy the finer things in life (erm, who doesn’t? ), then you’ll love the Southbank Food Market. It’s one of the best London street markets on Sunday if you’re looking for delicious food. Just some of the temptations on offer include local and international wine, perfectly roasted coffee and yummy baked goods. There’s also fresh produce on offer. An ever-changing roster of multicultural street food completes the experience, with everything from Polish sausages to Ethiopian-inspired vegan dishes. The combination of food, design and music makes the Canopy Kings Cross market one of the best in London. The producers here are all high-quality, offering beautiful designer goods as well as scrumptious smallgoods, preserves and cheeses. As the stallholders are nearly all independent creators, you can feel great about splurging here, as the money goes to supporting up and coming artisans in London. 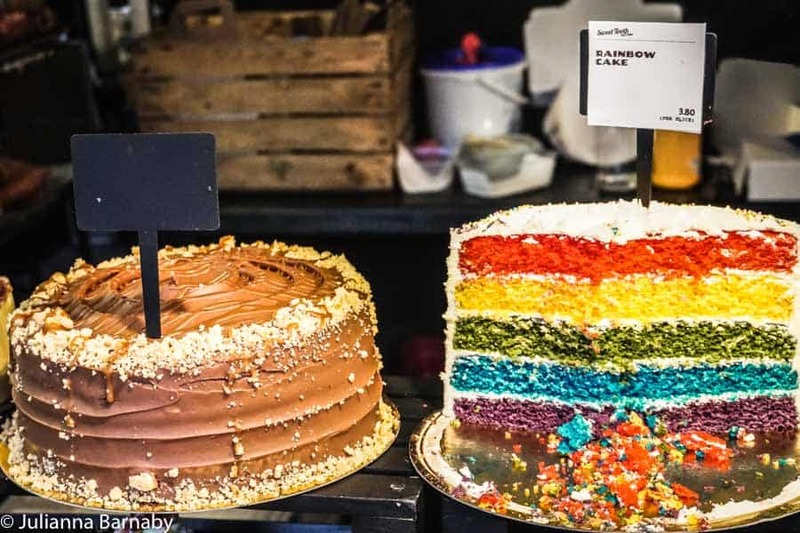 If you’re looking to spend a whole day exploring some of the best London markets open on Sunday, without having to go too far, Brick Lane is a great choice. There’s a total of five excellent markets in the area, each with its own theme: the Sunday Upmarket or the Vintage Market for fashion, the Backyard Market for art (including the wearable kind) and the Tea Rooms for vintage furniture. Then you have the Boiler House Hall, offering more than 30 delicious multicultural food stalls. In particular, the Jewish bagels and Bangladeshi curries are absolutely scrumptious. Many of the Sunday markets in London have a distinctly vintage feel, and Chatsworth Road Market has the history to go along with it. In the 1930s, it was one of the most popular markets in London, with more than 200 stallholders selling their wares to fashionable Londoners. Despite a hiatus back in the 90s, the market is now back. It sells a great range of products, with an emphasis on vintage clothing and scrumptious food. Petticoat Lane Market is a fashion market with an even longer history, dating back more than 400 years. It gets its name from when its location of Middlesex Street was the place to pick up petticoats and lace, important Victorian undergarments. Today, it’s a little more eclectic. Sunday is by far the best day to visit the market, and there are often more than 1,000 stalls selling all kinds of things. There’s an emphasis on fashion and leather goods (ranging from the fabulous to the distinctly tacky), but there’s also general bric-a-brac such as books, records and homewares. Looking to fill your fridge with some delicious delicatessen items as well as fresh and healthy fruit and veg? If so, Northcote Road Market is a great choice. It sells all your farmer’s market favourites, as well as other items like clothing, arts, books and even furniture. Obviously, there’s quite the variety, so you can easily make a day out of visiting this great Sunday market in London. The charming Victoria Park Market is just as much about the beautiful setting as the great wares for sale from the stalls. Nestled in Victoria Park, the market is surrounded by trees and green grass, making it a beautiful place to do some shopping. As for the stalls, you’ll find a great selection of produce from fresh fruit and veg, to locally brewed beer and spirits, as well as preserves and spreads. There’s also frequent live music to add to the overall atmosphere. 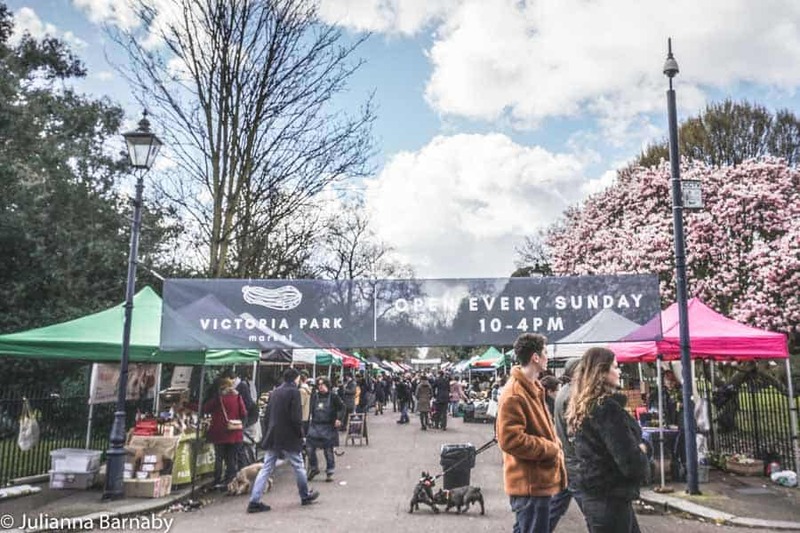 With a mouthwatering variety of fresh produce, smallgoods and deli items, Alexandra Palace Farmers Market is one of the best Sunday food markets in London. It’s a taste of a real country farmers market, but with a London twist. As well as the fresh and local fresh fruit and vegetables, you can find many multicultural goods such as Mediterranean olives. If the sight of it has your tummy rumbling, there’s a great selection of street food stalls as well. The cheese toasties are a particular delight. Brixton Farmers Market is a friendly fresh produce market with a small but scrumptious selection of stalls. Some of the highlights include raw honey, freshly baked pastries and herbal teas. It’s also a great place to pick up organic and sustainable meat and dairy. Should you get hungry, I highly recommend grabbing a bite from Zinglefoods, serving up North African-inspired vegan falafel wraps. This charming market has an ever-rotating selection of stallholders selling seasonal fruit, vegetables and herbs. You can stock your whole fridge and pantry from the charming Marylebone Farmers Market, so long as you don’t mind shopping with an open mind! Some of the most popular include The Potato Shop and Riverdale Organic Farm. The market is only open from 10 am to 2 pm on Sundays, so you’ll want to plan your visit carefully! 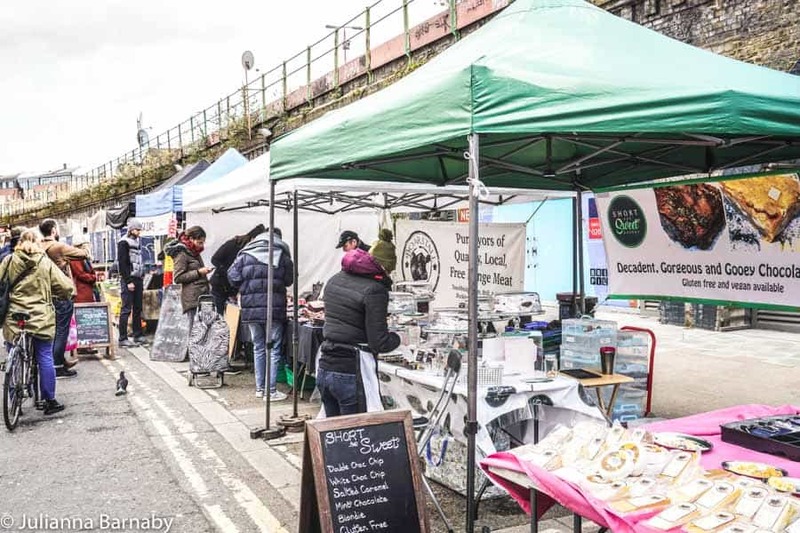 A great Sunday market is friendly and approachable, just like the Herne Hill Farmers Market. 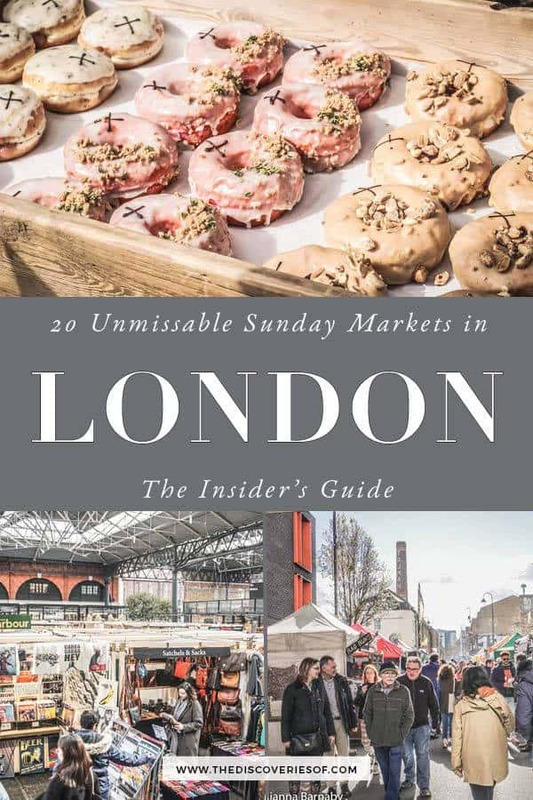 One of the newer of the Sunday markets in London, it’s nonetheless quickly established itself as a local favourite. With more than 50 stalls selling delicious local produce as well as other arts and crafts, it’s certainly well-deserved. Walthamstow Farmers Market has been offering delicious fresh produce and smallgoods from 10 am to 2 pm on Sundays since 2007. There’s a good variety of stallholders, with a few favourites including handmade pasta from Seriously Italian and unpasteurised milk from Happy Cow. The market is located along the high street, so you can also shop at the bricks-and-mortar stores afterwards, to make a day out of it. Click here for a map of the Sunday markets featured. While a lot of traders have started taking card payments, there are some that are still cash only – bring some cash with you just in case. It’s always easier to get to a market using public transport rather than driving as parking can be scarce and expensive. Not content with just popping into a market for a browse? Why not take a market tour? 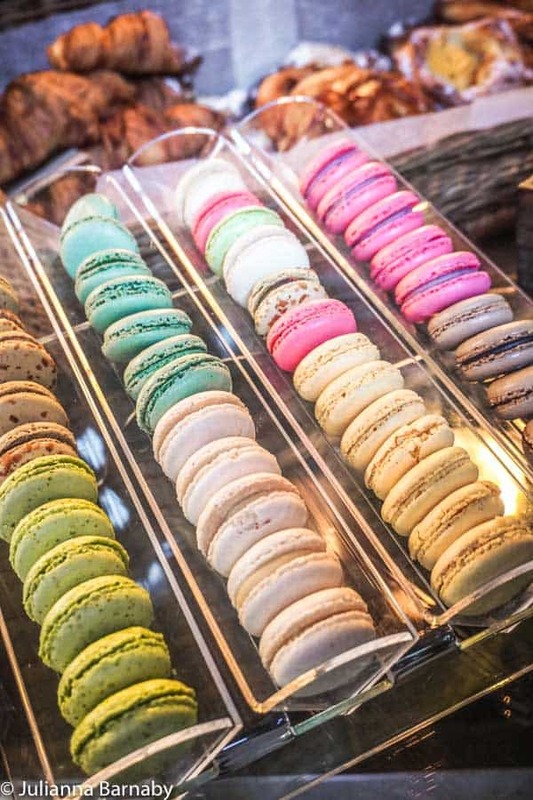 From tasting traditional British foods to exploring Camden Market, there are lots of cool market tours that let you glimpse a different side of London’s markets. Have a look.